The Dodgers fell tonight to the D-Backs, 3-2, which marked their third-straight loss and puts them one loss away from literal averageness. While the Dodgers were lucky to even be in this game given the amount of loud, deep contact starter Mike Bolsinger surrendered, the offense was about 0-for-5000 with runners in scoring position and couldn’t take advantage of any chance they got. Bolsinger struggled through 76 pitches in 4 2/3 innings, giving up three runs on five hits. He did strike out five, but he gave up two solo shots (Paul Goldschmidt, Jake Lamb) and easily could’ve given up like six homers since he gave up about nine balls hit to the warning track. Fortunately, he didn’t, and the Dodgers were in the game. J.P. Howell followed out of the pen and got his two batters on four pitches. Pedro Baez then entered to face Goldschmidt, who promptly hit a missile down the right-field line that was initially ruled a homer. However, fortunately, on review it was overturned, and Baez ended up getting 1 2/3 innings without giving up a hit, thanks in part to Joc Pederson‘s stellar defensive effort. Never a doubt in Pedro. Louis Coleman was up next, and he got one out before giving up a clean single and being relieved by Adam Liberatore. Liberatore walked the only man he faced on a questionable ball four call, and Joe Blanton had to be brought in to get the double play and get out of the inning. What else was there? Oh right, the Dodgers offense, sorta. The Dodgers offense got started in the first, when after a one-out single by Corey Seager, Justin Turner smoked a ball off the center-field wall for a an RBI double. The offense also got a run in the fifth, when Seager absolutely crushed a ball over the pool in right field. That said, while the offense managed seven hits and five walks, including the homer and three doubles, they were incredibly poor situationally. They wasted scoring chances in the first, second, third, sixth, and seventh innings. But the problem was never more apparent than in the eighth when Daniel Hudson walked the bases loaded with one out, but then Enrique Hernandez struck out on three pitches against D-Backs closer Brad Ziegler and Howie Kendrick lined a ball into center which Michael Bourn caught with a diving effort. That capped the Dodgers being 0-for-11 with RISP on the night, stranding 10 runners. Not caring is your best option at this point. 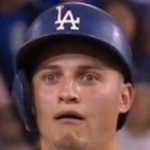 The Dodgers are now 33-32 overall on the year, and drop to 16-18 away from home. The Dodgers have the D-Backs again tomorrow at the same time of 3:40 HST/6:40 PST/9:40 EST, with the pitching matchup being Kenta Maeda against Archie Bradley.